BBC (2019a). Huawei: The escalation of technology war between China and USA and the possibilities of following ZTE华为：中美科技战升级和步中兴后尘的可能性. Available at: https://www.bbc.com/zhongwen/simp/chinese-news-46903685 (accessed March 6, 2019). BBC (2019b). Huawei: Should we be worried about the Chinese tech giant? Available at: https://www.bbc.com/news/business-46465438 (accessed March 6, 2019). BBC (2019c). The technology war between U.S. and China continues中美科技战继续：华为事件后盘点已站队的美国盟友. Available at: https://www.bbc.com/zhongwen/simp/world-47216457 (accessed March 6, 2019). BDI (2019). China – Partner and Systemic Competitor. Available at: https://english.bdi.eu/publication/news/...mic-competitor/ (accessed March 6, 2019). Bloomberg (2018). How Fear of Huawei Killed $117 Billion Broadcom Deal. Available at: https://www.bloomberg.com/news/articles/...-deal-quicktake (accessed March 6, 2019). Bode, K (2018). Leaked Trump Plan To 'Nationalize' Nation's 5G Networks A Bizarre, Unrealistic Pipe Dream. TECHDIRT WIRELESS. Available at: https://www.techdirt.com/articles/201801...ipe-dream.shtml (accessed March 6, 2019). CKGSB (2017). The Successes and Failures of Huawei’s M&A in U.S.华为美国并购得与失. Available at: http://www.ckgsb.edu.cn/mobile/detail/4646 (accessed March 6, 2019). DW (2019). Deutsche Sicherheitsbehörden warnen vor Huawei. Available at: https://www.dw.com/de/deutsche-sicherhei...awei/a-47301398 (accessed March 6, 2019). FAZ (2019a). BDI-Chef warnt davor, Huawei auszuschließen. Available at: https://www.faz.net/aktuell/wirtschaft/d...n-16027381.html (accessed March 6, 2019). FAZ (2019b). Merkel stellt Bedingungen für Huawei-Auftrag. Available at: https://www.faz.net/aktuell/wirtschaft/d...u-16024961.html (accessed March 6, 2019). Financial Times (2019). UK cyber security chief says Huawei risk can be managed. Available at: https://www.ft.com/content/4c2b6fa0-350d...3a-8b2a211d90d5 (accessed March 6, 2019). Forbes (2018). The Feds Shamefully Persecute China's Huawei For Being Too Successful. Available at: https://www.forbes.com/sites/johntamny/2...too-successful/ (accessed March 6, 2019). GRAND VIEW RESEARCH (2018). U.S. Communication Equipment Market Size, Share & Trends Analysis Report By Product (Mobile, Fixed-line), Competitive Landscape, And Segment Forecasts, 2018 – 2025. Available at: https://www.grandviewresearch.com/indust...quipment-market (accessed March 6, 2019). Handelsblatt (2019a). Der 5G-Ausbau wird zum Kraftakt für die Deutsche Telekom. Available at: https://www.handelsblatt.com/technik/dig...m/24022534.html (accessed March 6, 2019). Handelsblatt (2019b). Vodafone hält Huawei beim 5G-Aufbau die Treue – doch nicht bedingungslos. Available at: https://www.handelsblatt.com/unternehmen...s/23910294.html (accessed March 6, 2019). Handelsblatt (2019c). BSI-Chef hält sich aus Streit um Huawei und 5G heraus. Available at: https://www.handelsblatt.com/politik/deu...teaxI7YXN6H-ap2 (accessed March 6, 2019). KN (2019). Die Huawei-Entscheidung gehört ins Parlament. Available at: http://www.kn-online.de/Nachrichten/Poli...t-ins-Parlament (accessed March 6, 2019). Lewis, J. A. (2018). Telecom and National Security. CSIS. Available at: https://www.csis.org/analysis/telecom-and-national-security (accessed March 6, 2019). Lind, M. (2018). America vs. Russia and China: Welcome to Cold War II. THE NATIONAL INTEREST. Available at: https://nationalinterest.org/feature/ame...ld-war-ii-25382 (accessed March 6, 2019). MA REVIEW (2016). Für Huawei ist Deutschland zweiter Heimatmarkt. Available at: https://www.ma-review.de/epaper/epaper-U...page36.html#/36 (accessed March 6, 2019). NY Times (2012). U.S. Panel Cites Risks in Chinese Equipment. Available at: https://www.nytimes.com/2012/10/09/us/us...ity-threat.html (accessed March 6, 2019). NY Times (2019a). Administration Readies Order to Keep China Out of Wireless Networks. Available at: https://www.nytimes.com/2019/02/12/us/po...2987.1550825317 (accessed March 6, 2019). NY Times (2019b). America Pushes Allies to Fight Huawei in New Arms Race With China新军备竞赛：美国敦促盟友阻止华为参与5G建设. Available at: https://cn.nytimes.com/usa/20190128/huaw...-5g-technology/ (accessed March 6, 2019). NY Times (2019c). How Huawei Wooed Europe With Sponsorships, Investments and Promises. Available at: https://cn.nytimes.com/technology/201901...ope-china/dual/ (accessed March 6, 2019). POLITICO (2018). US ramps up pressure on Berlin over Huawei. Available at: https://www.politico.eu/article/us-ramps...-trump-hackers/ (accessed March 6, 2019). PR Newswire (2018). United States $125+ Billion Communication Equipment Market Analysis 2015-2018 & Forecast to 2025. Available at: https://www.prnewswire.com/news-releases...-300745824.html (accessed March 6, 2019). Project Syndicate (2018). The War on Huawei. Available at: https://www.project-syndicate.org/commen...d-sachs-2018-12 (accessed March 6, 2019). Jiemian界面 (2017). Why is Huawei’s “American Dream” so difficult?华为的“美国梦”为何如此艰难? Available at: https://www.jiemian.com/article/1508141.html (accessed March 6, 2019). REUTERS (2018). Exclusive: U.S. lawmakers urge AT&T to cut commercial ties with Huawei – sources. Available at: https://www.reuters.com/article/us-at-t-...s-idUSKBN1F50GV (accessed March 6, 2019). REUTERS (2019). U.S. won't partner with countries that use Huawei systems: Pompeo. Available at: https://www.reuters.com/article/us-huawe...o-idUSKCN1QA1O6 (accessed March 6, 2019). SCMP (2019). European Union finds itself in crossfire in Huawei battle. Available at: https://www.scmp.com/business/companies/...e-huawei-battle (accessed March 6, 2019). Sina新浪 (2019). Ren Zhengfei received interview with BBC任正非BBC采访：美国以为抓了孟晚舟华为会衰落，错了. Available at: https://finance.sina.com.cn/chanjing/gsn...ka7088827.shtml (accessed March 6, 2019). SZ (2019). Netzbetreiber bereiten Huawei-Verzicht in Kernnetzen vor. Available at: https://www.sueddeutsche.de/news/wirtsch...90201-99-812704 (accessed March 6, 2019). USCC (2011). THE NATIONAL SECURITY IMPLICATIONS OF INVESTMENTS AND PRODUCTS FROM THE PEOPLE’S REPUBLIC OF CHINA IN THE TELECOMMUNICATIONS SECTOR. Available at: https://www.uscc.gov/sites/default/files...tionsSector.pdf (accessed March 6, 2019). VOA (2019). The prime minister of New Zealand said there was still no final decision on using Huawei products新西兰总理称仍未最后决定是否使用华为网络设备. Available at: https://www.voachinese.com/a/new-zealand...19/4794149.html (accessed March 6, 2019). WSJ (2010). Security Fears Kill Chinese Bid in U.S.. Available at: https://www.wsj.com/articles/SB100014240...596611547810220 (accessed March 6, 2019). Huawei is widely regarded as China's most outstanding, powerful, and most aggressive ICT (Information Communication Technology) company. It has been committed to entering the U.S. market. However, contrary to its outstanding performance in other markets, Huawei has long failed to achieve a major breakthrough in the U.S. market. This is so because the state apparatus of the U.S. has prevented American customers from purchasing Huawei's products, solutions, and services on the grounds of national security. In 2018, the U.S. launched its strongest ever actions against Huawei. In December 2018, the U.S. Department of Justice ordered the arrest of Huawei's CFO Meng Wanzhou on the grounds that the company was suspected of violating US sanctions against Iran, and asked Canada to extradite Meng to the United States for trial. At the same time, the United States decided to ban Huawei from participating in the construction of the 5G network of strategic importance. A lot of signs indicate that the U.S. state apparatus has made the crackdown on this successful technology company—which is seen as the epitome of China's rise—an important strategic goal, and is sparing no effort to mobilize its traditional and emerging allies to join its ranks. In stark contrast to the frosty reception and restriction in the U.S. market, Germany has been quite welcoming for Huawei's investment and business activities. Huawei also places special emphasis on the German market, and its Western European headquarters is located in a western German city, Düsseldorf. This is not only because of Germany's leading market size in Europe, but also because as a major developed country Germany's acceptance and recognition has an extraordinary demonstration effect for Huawei's business development in the global market. Over the years, Huawei has continued to invest a lot of resources in Germany, and its market share continues to increase. Germany is so important for Huawei that Torsten Küpper, head of Public Relations of Huawei Germany, called Germany the “second hometown” of Huawei (MA REVIEW, 2016). However, as Germany's most powerful ally and security provider since the end of World War II, the United States urged Germany to follow Australia, New Zealand, and Japan to join its international action against Huawei and to ban Huawei from participating in construction of the 5G network. Hence, Germany faces a difficult decision to choose between the two most powerful countries of the world: the United States and China. This article is not intended to predict how Germany will take sides, but to systematically analyze the similarities and differences between Germany and the United States in terms of position and policy towards Huawei, the opinions of different German stakeholders, the determinants of German decision-making, as well as the impacts of German decision on Sino-German relations and the changing world order. The United States is the world's leading communications equipment market with a market capacity of US$83.22 billion in 2016 (GRAND VIEW RESEARCH, 2018) and is expected to reach US$125.1 billion by 2025 (PR Newswire, 2018). Therefore, breaking through the U.S. market has a decisive strategic significance for ambitious Huawei. As early as in 1999, Huawei opened a research institute in Dallas to develop products specifically for the U.S. market. In June 2001, Huawei established FutureWei, a wholly-owned subsidiary in Texas, to begin selling broadband and data products to local businesses. As Huawei advanced in the U.S. market, doubts about Huawei's products came to the fore. In early 2003, Cisco sued Huawei in a court in Texas for infringement of its intellectual property rights. After one year and a half of patent disputes, the two sides finally reached a settlement. However, this dispute seriously affected Huawei's reputation in the U.S. market, making Huawei's business progress very slow (Jiemian, 2017). In 2007, Huawei and the U.S. mobile operator LeapWireless reached a mutual agreement - a first for Huawei. Thereafter, Huawei began to make some market progress. However, Huawei mainly provided services to some small and medium-sized operators, and has been unable to enter in league with the four major communication operators in the U.S. market (Verizon, AT&T, Sprint, and T-Mobile) (Jiemian, 2017). -In 2010, Huawei attempted to acquire 2Wire, a broadband network software vendor, but failed because it was unable to obtain approval. -In 2010, Huawei acquired 3Leaf's patented technology for US$2 million, but this deal was once again considered by CFIUS as “threat to U.S. national security”. Huawei finally revoked the transaction in February 2011. In addition to the failures of M&A, Huawei's contracts for supplying 4G equipment with AT&T (in 2009) and Sprint (in 2010) were also rejected by intervention of the U.S. National Security Agency (NSA) (USCC, 2011) and the U.S. Department of Commerce (WSJ, 2010). In October 2012, after more than one year of investigations on Huawei and ZTE, the U.S. House Intelligence Committee issued a report accusing the two largest Chinese telecommunications equipment companies of being arms of the Chinese government that had stolen intellectual property from American companies and could potentially spy on Americans. The House Intelligence Committee came to the conclusion that Huawei and ZTE were a national security threat because of their attempts to extract sensitive information from American companies and their loyalties to the Chinese government. Therefore, the United States government was asked to not do business with Huawei and ZTE and American companies were recommended to avoid buying their equipment (NY Times, 2012). After the report of the House of Representatives, the network equipment market of U.S. telecommunications operators was closed for Huawei. But Huawei still tried to sell mobile phones and other terminal products in the United States. However, this too was also strongly restricted. In January 2018, at the urging of U.S. lawmakers, AT&T, a large US telecommunications operator, cancelled its Smartphone deals with Huawei. The reason behind this was the concern that Huawei “will pose a threat to U.S. national security” (REUTERS, 2018). In March 2018, according to the suggestion of CFIUS, U.S. President Donald Trump blocked Singaporean Broadcom's hostile takeover bid worth of US$117 billion of Qualcomm, a well-known American communications chip and wireless technology company. The reason was that CFIUS is worried that successful acquisition by Broadcom will lead to possible reduction of R&D investment in Qualcomm, which will indirectly benefit Qualcomm's Chinese competitor Huawei—thereby jeopardizing the“national security” of the U.S. (Bloomberg, 2018). The Trump Administration is extremely concerned that Huawei as a Chinese company could gain technological superiority and dominance over the United States, especially in the field of 5G mobile communications—which is regarded as the battlefield of the new era of arms race by the U.S. government. Compared with previous U.S. Administrations, the Trump Administration's restrictions against Huawei have increased. Along with the U.S. government, the U.S. Congress is also alert to the operations of the two Chinese ICT companies, Huawei and ZTE. Following the 2012 House Intelligence Committee report, the Senate's 2019 John S. McCain Defense Authorization Act, passed on July 22, 2018, explicitly forbade the U.S. federal government to purchase any equipment or services from Huawei or ZTE . In early December 2018, the U.S. Department of Justice issued a warrant for the arrest of Huawei's CFO Meng Wanzhou on the grounds of suspected violation of the U.S. sanctions against Iran. The U.S. also asked Canada to extradite Meng to the United States for trial. 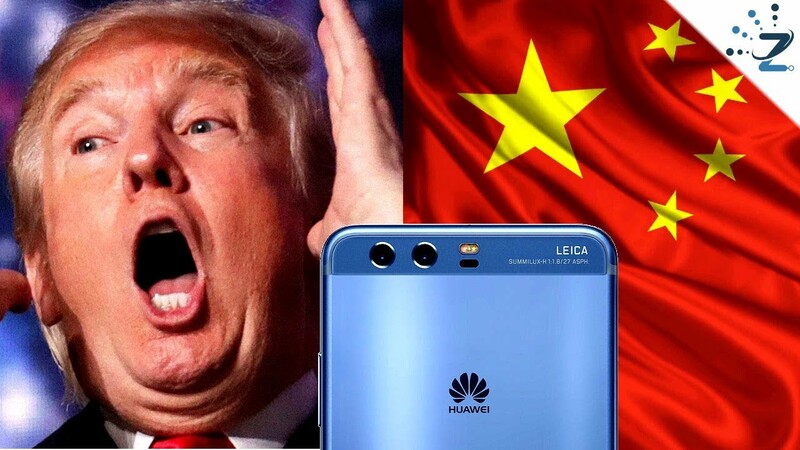 Moreover, according to a New York Times report on February 12, 2019, President Trump will issue an executive order to prohibit U.S. telecommunications operators from using Chinese equipment in the construction of next-generation wireless networks (NY Times, 2019a), thereby excluding Huawei and ZTE—especially Huawei, which is a leading technology company in 5G field—from 5G network rollout in the U.S. market. At the same time, the U.S. government launched high-profile international action against Huawei, demanding that the international community, especially American allies, follow the United States and ban Huawei from participating in the construction of 5G networks. U.S. Secretary of State Mike Pompeo even warned that the United States will not be able to partner or share information with countries using Huawei equipment (REUTERS, 2019). This is obviously a strong signal asking countries to choose between the United States and China. Rome was not build in a day. The United States' restrictions against China's leading ICT companies, Huawei and ZTE—especially against Huawei, which is more powerful—have been long in the making in treating them as threats to “national security”. Concrete policies and measures to prevent and restrict them are also being implemented. In this regard, both Republicans and Democrats, both the House of Representatives and the Senate, and the federal government have reached a consensus. The U.S. arrest of Huawei's CFO and a series of strong actions against Huawei are not just legal and network security technology issues, but also geo-economic issues related to economic and technological competition. In other words, this is a geopolitical issue. It cannot be denied that the United States has also punished many American and other countries' companies violating U.S. sanctions, but it is extremely rare to directly arrest company executives (Project Syndicate, 2018). In the view of Huawei's founder Ren Zhengfei (Meng Zhouzhou is also his daughter), the purpose of the U.S. move is to achieve the biggest hit on Huawei (Sina, 2019). Taking making business with Iran as a basis for punishment might be justified from a legal perspective, but it is very suspicious politically. Even if it is legally justified, there is still a possibility of “selective” law enforcement. As an article published in Forbes magazine pointed out, many U.S. companies trade all the time with Cuba, Iran, Sudan, and Syria. They just do so through intermediaries (Forbes, 2018). Moreover, the legal basis for supporting this arrest—“long arm jurisdiction”—is not a rule of international law. Many countries believe that it seriously violates the principle of international law that “a country should not exercise state power in the territory of another country”, therefore they do not recognize the validity of its jurisdiction. In the eyes of Beijing, the U.S. is exercising its state power to suppress a Chinese company regarded as a source of national pride in China: the substance of the issue is that the U.S. is using legal means to replace fair market competition. Given the strategic importance of 5G infrastructure, the U.S. government places great emphasis on cyber security. In order to address concerns about China's rapidly increasing influence on the global communications supply chain, the National Security Council has had the idea of building a “nationalized” national 5G network by the state rather than private operators so as to strengthen control over the network (Bode, 2018). Although this plan has not been implemented, considering that the United States has a liberal tradition of "small government, big market" and has always avoided excessive involvement of the state in economic affairs, the U.S. government's unprecedented emphasis on 5G network security should by no means be underestimated. For Huawei, entering the markets of developed countries like the United States and Western Europe is of particular importance. On the one hand, the huge size of the U.S. and European markets is very attractive for Huawei—which is extremely focused on business expansion. If Huawei's products and solutions are recognized by highly demanding European and American customers, this will have a great demonstration effect for other countries. Therefore, Huawei often invests a lot of resources at all costs and does not miss any opportunity to enter the European and American markets. In 2010, in order to address the British government's concerns about the safety of Huawei products, Huawei and UK's highest-level intelligence department, the Government Communications Headquarters (GCHQ), jointly established Huawei Cyber Security Evaluation Centre, which is responsible for conducting the safety assessment of Huawei's products deployed in the UK market. On February 21, 2019, the Financial Times reported that Ciaran Martin, Director of the National Cyber Security Centre (NCSC) under GCHQ, said he was confident that the UK network security authority will be able to control any risk posed by Huawei even if the British government allowed it to participate in the construction of a 5G network. In a speech in Brussels, Martin said that although US intelligence agencies raised concerns about espionage and disruption, he believed that strict controls and supervision could offset the risks (Financial Times, 2019). The United Kingdom is a close ally of the United States, and the NCSC has had many years of practical experience in assessing the safety of Huawei products. Therefore, the conclusions of the UK cyber security authority are quite weighty, indicating that security concerns about Huawei's products can, at least, be technically addressed. Although the United States has always suspected that Huawei's products have a "back door" which could be used by the Chinese government and military to engage in espionage, this has never been proved. Therefore, it is difficult to believe that the debate on security issues around Huawei is only a purely technical issue. The Trump Administration believes that the world is engaged in a new arms race. Although this is a competition involving technology, not conventional weapons, it poses an equally significant threat to U.S. national security. In an era in which the most powerful weapons are controlled by computer networks, any country which dominates 5G technology will have economic, intelligence, and military advantages throughout this century. The United States has lagged behind Europe and China in the eras of 3G and 4G, and Huawei's overall lead in 5G technologies has further worried the United States. Therefore, the United States is determined to take all possible measures to block Huawei in order not to lose in this vital competition (NY Times, 2019b). According to Jeffrey Sachs, a professor at Columbia University, “Quite transparently, the U.S. action against Meng is really part of the Trump Administration's broader attempt to undermine China's economy by imposing tariffs, closing Western markets to Chinese high-technology exports, and blocking Chinese purchases of US and European technology companies. One can say, without exaggeration, that this is part of an economic war on China, and a reckless one at that. America’s motivations in this economic war are partly commercial—to protect and favor laggard US companies—and partly geopolitical. They certainly have nothing to do with upholding the international rule of law. The Trump Administration, not Huawei or China, is today's greatest threat to the international rule of law, and therefore to global peace (Project Syndicate, 2018)." Economic development is fundamentally driven by innovation. Although the United States still has overall advantages, China is catching up quickly in all directions. In some areas, such as 5G, China is even ahead of the U.S. For the U.S., loss of technological dominance is unacceptable and it is determined to use all its means to defend its innovation advantages. In the Sino-American trade war, the real interests of the United States lie in not just reducing its trade deficit towards China. Since a large part Chinese exports actually come from American companies, the trade deficit is actually not the root cause of the trade war and China's gains are not as large as the numbers indicate. If the goal is only to reduce the trade deficit, then China is actually willing to make concessions and the negotiations should have reached an agreement. The real purpose of the United States is to stop the advancement of China's high-tech industry (BBC, 2019a). In fact, Huawei's huge market share in Europe shows that it is widely accepted in Western countries. However, the key issue is that Huawei is a Chinese company. William R. Evanina, the Director of U.S National Counterintelligence and Security Center, said, “It's important to remember that Chinese company relationships with the Chinese government are not like private sector company relationships with governments in the West. China's National Intelligence Law passed in 2017 requires Chinese companies to support, assist and cooperate with China's intelligence agencies, wherever these companies operate (NY Times, 2019b).” China is an authoritarian country and a Chinese company like Huawei is unable to resist the demands of the Chinese government. Therefore, the network equipment of Huawei poses a potential threat to the national security of the U.S. (BBC, 2019b). At the Munich Security Conference held in February 2019, the U.S. Vice President Mike Pence once again emphasized that “The United States has also been very clear with our security partners on the threat posed by Huawei and other Chinese telecom companies, as Chinese law requires them to provide Beijing's vast security apparatus with access to any data that touches their network or equipment (SCMP, 2019)”. This shows that the United States is worried not about Huawei per se but China's state apparatus as a whole: the actions against Huawei are not only pure legal issues, but also a significant geopolitical action. Heli Tiirmaa-Klaar, an Estonian diplomat involved in cyber security discussions with American and European officials about Huawei, said Europe was shifting on Huawei because of suspicions about China rather than any specific behavior of this company. She highlighted China's history of hacking and stealing trade secrets, its poor record on human rights and internet censorship, and Chinese cyber security rules that could require Chinese enterprises to defend China's national security interests (NY Times, 2019c). James Andrew Lewis, the Senior Vice President and Director of Technology Policy Program from the American think-tank, Center for Strategic and International Studies, believes that “If China was not a strategic competitor, buying Chinese telecom equipment would pose little risk, and commercial partnership would serve both sides (Lewis, 2018).” But, unfortunately, according to the National Security Strategy released by the Trump Administration in December 2017, the United States has regarded China as its primary strategic competitor. This means that Huawei, as a Chinese company, will pose a major threat to the national security of the U.S. through its communication network equipment. Therefore, the issue of Huawei has actually become a matter of geopolitical competition between the United States and China. In addition, the ideological differences between the U.S. and China have also played a role in this dispute. In the eyes of the United States, China's authoritarian state capitalism model is significantly different from the liberal market capitalism of Western countries. At present, this model has a certain attraction to some developing countries. Given its great success over the past few decades and its huge scale, China is now eligible to compete against the Western model. In recent years, China has vigorously promoted its “Belt and Road Initiative”. From the perspective of the United States, China is not only pushing through its geopolitical “grand strategy”, but also trying to export its development model which is remarkably different from the “Washington Consensus”. Thus, China is increasingly challenging the international order and structure established and dominated by the U.S. and Western countries in not only geopolitical but also ideological terms. Since Huawei has achieved great business success, especially in overseas markets, most Chinese people prefer to ignore the ruthless management of this company and regard it as emblematic of China's national pride. The United States' attack on this company, widely admired in China, without incontrovertible grounds will probably provoke Chinese people's nationalist sentiments, thus boosting the influence of nationalist forces in China's domestic politics and further strengthening China's authoritarian regime. Therefore, in terms of promoting more “liberalization” in China, the actions against Huawei seems to be counterproductive. As early as 2001, Huawei began to develop business in Germany. After years of efforts, all of its three major businesses groups (carrier business group, consumer business group, and enterprise business group) have made great progress. At present, Huawei is the prime strategic partner of Germany's three major telecommunications operators (Deutsche Telekom, Vodafone, and Telefonica) in terms of supplying network equipment. For the smartphone business, Huawei's market share has surpassed Apple and made it the second largest mobile phone brand after Samsung. In addition, Huawei provides products and solutions of cloud computing, Internet of Things, enterprise network, and network security for various industrial sectors. It has also achieved major breakthroughs, such as building a smart city for Duisburg and providing high performance computing solutions for BMW. For Huawei, the German market is of extreme importance—perhaps second next to the Chinese market. On the one hand, the German market is huge; on the other hand, Huawei is a company coming from a developing country, therefore its Chinese managers are extremely eager to win the acceptance and recognition of the main, established, Western developed countries such as the U.S., the UK, France, and Germany. However, the United States, the UK, and France have imposed more restrictions on Huawei than Germany. Germany's attitude towards Huawei is relatively more pragmatic, allowing this Chinese company to utilize Germany's free and open economic environment to gradually grow into a heavyweight player. Huawei is also trying to make its projects in Germany references for its customers around the world. Therefore, Huawei has made huge investments in Germany regardless of cost. In 2007, Huawei moved its European headquarters from the UK to Düsseldorf, a western German city, and established its European R&D center in Munich to manage its 18 R&D institutions across Europe. From 2014 to 2018, Huawei invested US$400 million in Munich. By the end of 2015, Huawei had more than 2,000 employees in Germany, it is now one of the largest Chinese enterprises in Germany (MA REVIEW, 2016). Today, Huawei is prominent in Germany and industries and federal governments must think carefully when dealing with issues related to Huawei. The United States has not only banned the purchase of Huawei's products in the U.S., but also launched a high-profile international action against Huawei and urged its allies to join it. Currently, among the countries of the U.S.-led “Five Eyes Intelligence Alliance” (U.S., UK, Canada, Australia, and New Zealand), Australia and New Zealand have decided to follow the U.S. The UK has not yet decided, but British Telecom (BT) has decided that in the future Huawei shall be excluded from the core network of the 5G (but Huawei is still allowed to participate in the construction of wireless network). Moreover, BT will dismantle Huawei's equipment in the existing core network; Canada has not yet made a decision. In addition, Japan, as a close ally of the United States in East Asia and China's geopolitical rival, also announced in December 2018 that Huawei would be excluded from the government procurement list. Japan's three major telecommunications operators also indicated that they would follow the government's decision to prevent Huawei from participating in construction of its 5G network (BBC, 2019c). Among the European allies of the U.S., Germany's decision is crucial and all of Europe is watching Germany. According to the political news website POLITICO, in a closed-door meeting in December 2018, U.S. technology experts presented German policymakers with information they described as “reasons” to exclude Chinese telecom giant Huawei from the rollout of 5G technology in Germany. U.S. officials know Berlin's attitude is crucial when it comes to setting the tone toward Huawei across Europe. As the bloc's largest economy, Germany's decision on whether to restrict the Chinese company is likely to serve as a model for other European countries, many of which depend on Berlin's cyber security expertise (POLITICO, 2018). It will also determine whether the U.S. campaign is as successful in Europe as it was in Australia, Japan, and New Zealand. Given that Germany will auction 5G spectrum in the spring of 2019 and that telecommunications operators are in the process of starting 5G construction, this sudden pressure from its powerful traditional ally, the U.S., is putting Germany in a dilemma. On the one hand, Germany must seriously consider the demands of the U.S. On the other hand, in complying with the U.S. Germany risks angering China—an emerging superpower and Germany's largest trading partner. Hence, it is very difficult for Germany to make a choice. Deutsche Telekom is the largest multinational telecommunications operator in Europe and has enjoyed a good relationship with Huawei for many years. On the one hand, Deutsche Telekom CEO Timotheus Höttges said, “the security of the network infrastructure, both past and present, is very important for us.” On the other hand, Deutsche Telekom continues to cooperate with Huawei. Given Huawei's technological leadership and price advantages, the progress of Deutsche Telekom's 5G rollout will get inevitably delayed and its construction costs increase if Huawei is not allowed to participate in the construction of the 5G network (Handelsblatt, 2019a). Nick Read, CEO of the UK-based Vodafone Group's German subsidiary, expressed some support for Huawei. He said, "We cannot ignore the fact that Huawei has occupied 35% of the entire European market. If Huawei is excluded, the progress of 5G network construction will be slowed down and the cost will increase. We need to clearly define which parts of the network can be built by Huawei, whether it is a sensitive core network or just a wireless access network." Given the security concerns, Vodafone decided that Huawei's products will no longer be used in the core network. However, Nick Read also defended Huawei. He said, "I feel that Huawei is open to the current situation and is working hard to improve the security of its products (Handelsblatt, 2019b)." Telefonica O2, another major German telecommunications operator, has opinions similar to Deutsche Telekom and Vodafone. It too does not want to ban Huawei from participating in its network construction. In order to address security concerns, Deutsche Telekom even suggested establishing a technical supervision agency similar to TÜV to ensure the security of network equipment, for which Vodafone and Telefonica expressed their support (SZ, 2019). Given the security concern, the German Federal Ministry of the Interior is discussing with the Federal Ministry of Economic Affairs to revise the German telecommunications law to de facto exclude Huawei. According to the Ministry of the Interior, the Telecommunications Law should make the following changes: telecommunications operators and equipment suppliers must be able to ensure that there is no (foreign) state influence. However, the revision of the Telecommunications Law is a long process, which means that in theory the current German law cannot exclude any foreign suppliers (including Huawei) from construction of the 5G network (DW, 2019). The German Foreign Ministry seems to be oblivious to the fact that China is Germany's largest trading partner and both countries have a strategic partnership. Their attitude is similar with that of the Ministry of the Interior. A spokesperson for the Ministry of Foreign Affairs stressed that Huawei is a Chinese company subject to Chinese law, and expressed concern that Chinese companies have the obligation to cooperate with Chinese intelligence agencies (DW, 2019). As the head of the German government, Merkel has always been cautious about important issues, especially the sensitive issue of taking sides between the two most powerful countries in the world. On February 5, 2019, Merkel said during her visit to Japan, "Given the security concerns, it is necessary to discuss with the Chinese government that companies (of China) cannot pass data to (Chinese) state (FAZ, 2019b)." She is actually setting conditions for Huawei to participate in the construction of the 5G network in Germany. It cannot be denied that Merkel is a seasoned politician. She has exerted "strategic ambiguity" to avoid clearly taking sides between the United States and China by considering the demands of both countries. Of course, it is also possible that she is buying time in order to make final choice. In addition to the stakeholders such as telecommunications operators, German industry, and the German government, it must be mentioned that Germany is a democratic country and public opinions often play a role in government decision-making. Accordingly, it is difficult to ignore the fact that German media reports on China are mostly negative. China is Germany's largest trading partner and German companies have huge investments and economic interests in the Chinese market. Germany and China have established comprehensive and profound strategic partnerships. Moreover, as a middle power, Germany does not have the ambition, will, and resources to confront China geopolitically. However, the United States is Germany's traditional ally and a powerful provider of security. The tough demands of the U.S. have given the German government a difficult choice. The final decision of the German government is still unclear. However, what is clear is that the German government will not make decisions quickly, but will carefully evaluate the situation and find the best balance in line with German interests. Some people even think that, given the importance of this matter, the German parliament and not the German government will have the final say (KN, 2019). Although the United States has spent a lot of efforts to convince its allies and other countries not to use Huawei's network equipment, it has had only limited results. At present, only the governments of Australia, New Zealand, and Japan have clearly stated that Huawei will be excluded from the construction of 5G networks (BBC, 2019c). However, on February 19, 2019 the Prime Minister of New Zealand, Jacinda Ardern, said that her government had not yet made a final decision on use of Huawei's equipment in the 5G network (VOA, 2019). Therefore, to date, only Australia and Japan have explicitly followed the United States. These signs show that this time the United States might have difficulties in successfully forming a united front against Huawei and China. Some European commentators believe that President Trump has undermined the trust between Europe and the United States, making it difficult for Europe to choose between China and the United States. At present, European countries will take precautions against Huawei, especially in its role as supplier of core networks, but they are not willing to explicitly exclude Huawei from the entire 5G network. Of course, Europe also knows that Huawei is not completely irreplaceable. The restrictions on Huawei may be beneficial to European suppliers of telecommunications equipment: Ericsson from Sweden, Nokia from Finland, and Alcatel-Lucent from France. If a Sino-American confrontation is on the line, then the ability of the United States to form alliances and control allies seems to be declining as compared to Cold War 1.0. In March 2015, as the closest ally of the United States, the United Kingdom did not hesitate to anger the United States and joined the China-led “Asian Infrastructure Investment Bank” (AIIB). Like other middle powers, Britain relies no longer solely on the United States but bets on both sides. For the UK, this is a matter of life and death. The focus of British economy lies in the service sectors, especially the financial service industry. If the UK cannot serve the financial and economic interests of a rising China, then the UK will be marginalized in the 21st century. In fact, apart from cooperating with China, the UK does not have much choice (Lind, 2018). Other European allies of the United States are also reluctant to sacrifice their commercial interests with respect to China by blindly obeying America's strategic needs. Compared with the formidable Soviet Red Army in Cold War 1.0 period, China's growing military power does not pose a direct threat to Western Europe. Ideologically, China is not as aggressive as the former Soviet Union which claimed to "bury the capitalist system". If the United States intends to contain China from now on, it would be difficult to win full recognition and acceptance of the Western European countries as it did during Cold War 1.0. Of course, the United States might not be very concerned about this. For the United States, the most important partners to contain China can be found in Asia-Pacific region: Japan, South Korea, and Taiwan are much more important in this regard than Western Europe. The "Indo-Pacific strategy" proposed by Japan, supported by Australia and India, and finally accepted by the United States, will become the main geopolitical strategy to contain China. The "democratic security diamond" comprising of the United States, Japan, Australia, and India will probably become a multilateral military alliance similar to NATO in Europe. Moreover, even if "old Europe" (France and Germany) does not follow the instructions of the U.S., the United States can still find more obedient partners in "New Europe" (Central and Eastern European countries). With its considerable strength and remaining leadership, the United States could form a united front to contain China. However, the internal solidarity of this coalition is quite suspicious. During the Cold War 1.0 period, the Eastern Bloc broke out between China and the Soviet Union. China turned to the United States and it was a strategic blow to Soviet leadership. Similarly, inside the Western Group, President Charles de Gaulle of France promoted independent foreign policy, built independent nuclear power, and withdrew from NATO. Even loyal West Germany advocated a “New Eastern Policy” under the Brandt government, under which West Germany tried to improve relations with the Eastern Bloc countries: this demonstrated the independence of West Germany. In 2003, the United States insisted on starting a war against Iraq, but France and Germany were openly and resolutely opposed. Similarly, in 2015, the UK, France, and Germany joined the China-led AIIB at the price of angering the United States. Therefore, even if the United States can successfully form a united front to contain China, it cannot guarantee that the member states will fully obey its will, and American values do not allow the United States to suppress the indiscretions of its allies by using force, as the former Soviet Union did with Hungary (1956) and with Czechoslovakia (1956) during the Cold War 1.0. However, it is debatable if Germany will be able to withstand pressure from the United States on the issue of Huawei. After Tian'anmeng incident in 1989, Europe and the United States imposed an arms embargo on China. For years, China has been trying to persuade the EU to lift the embargo. The then German Chancellor Gerhard Schröder supported China's request, and together with France vigorously promoted the lifting of the EU arms embargo on China. However, due to strong opposition from the United States, the effort finally failed. In some sense, today's issue of Huawei's entry into 5G network construction is similar to China's request to ask the EU to lift the arms embargo. On March 5, 1946, accompanied by U.S. President Truman, Churchill made the famous "Iron Curtain" speech in the United States, giving voice to the serious and urgent threat of Soviet expansionism. Churchill's speech is widely regarded as a crucial moment in the genesis of the Cold War. U.S. Vice-President Mike Pence's tough speech on China at the Hudson Institute in October 2018 was also considered by many to be a mobilization for Cold War 2.0 against China, which can be compared with Churchill's speech to open Cold War 1.0. If the United States and China are entering a new cold war, this time it would be significantly different from the old Cold War. The former Soviet Union relied mainly on its formidable military power to confront the West and posed a direct military threat to Western Europe. Moreover, the communism of the Eastern Bloc and the liberal democracy of the Western countries also constituted a fierce ideological confrontation. However, the rise of China is mainly due to its unprecedented economic development and rapid progress in science and technology. Its people's living standards have improved significantly: this, in turn, constitutes an important and main source of the legitimacy for the rule of the Chinese Communist Party. Another source is nationalism, but nationalism has always been a dangerous double-edged sword and Chinese rulers must use this force carefully. Therefore, if the United States wants to launch a new Cold War against China, economy and technology will be the main battlefields and the confrontation of military power and ideology will play a secondary role. However, if the United States and China cannot properly manage and control conflicts between them, it cannot be ruled out that the economic and technological contests will escalate to a full-scale confrontation of military power and ideology. In this context, as the epitome of China's rise and an outstanding representative of China's scientific and technological progress and economic development, Huawei has become the primary target of the United States. This is not surprising: it is a logical development of the U.S.-China confrontation. One year after Churchill's "Iron Curtain" speech, in March 1947, US President Truman gave a speech in Congress, which was later called "Trumanism". Truman announced that the United States was willing to provide economic and military assistance to the Greece government to fight against the Communist Party. Turkey faced a similar situation as Greece and would also receive U.S. aid. Trumanism meant the end of the alliance with the Soviet Union during the World War II and marked the beginning of the Cold War, since then the United States began to provide financial means to contain the Soviet Union. Similarly, US Vice President Pence's tough speech against China might be a public mobilization. Shortly afterwards, a comprehensive attack on Huawei started, probably marking the beginning of the new Cold War against China. The previous crackdown on ZTE could be considered a strategic rehearsal. The result was a great success. The Chinese side accepted all U.S. demands, even the assignment of U.S. inspectors to ZTE at ZTE's costs. Success of the action against ZTE is likely to give US the confidence to beat Huawei. The U.S.-China trade war was initiated by the United States. It is hard to conclude that China is willing to participate in this conflict that may terminate its rise. However, China's eagerness to seek success and its daring strategic advances in recent years have probably led it into a “Thucydides trap”. Now that China has abandoned Deng Xiaoping's strategy of keeping a low profile, it will surely bring the U.S.-China showdown ahead of schedule—which will be greatly detrimental to its own future. The actions of the U.S. against Huawei, emblematic of Chinese national pride, have touched sensitive nerves in both countries. The U.S. and China seem to be accelerating their fall into the so-called "Thucydides trap": this has led to overwhelming discussions and uneasiness around the world. The arrest of Huawei's CFO and the subsequent demand to ban Huawei from participating in the construction of vital 5G networks is not only a legal issue, technical issue, and geo-economic issue: it is also a geopolitical issue. Only in this context would we be able to understand why the U.S, a superpower, is worried about a Chinese company. Since the end of the Cold War, the world has undergone profound changes and a major power shift is taking place. The United States has gradually reached a conclusion that China is its prime strategic competitor, capable of challenging American hegemony over and above Russia, its traditional rival. The United States will not tolerate the strategic balance to continue leaning towards China. Under the leadership of President Trump, the United States will take firm and decisive actions to ensure that the United States continues to be the superpower with world hegemony. Faced with this situation, most countries are unable to stay outside. In the turmoil of whether or not Huawei should be allowed to participate in the construction of a 5G network, Germany is at the forefront of the storm and faces a difficult choice between the U.S. and China. Germany's decision will have a major demonstration effect, and all of Europe is watching Germany. However, Germany should not make a quick choice. Instead, it should carefully evaluate the situation, consider all parties' attitudes, repeatedly calculate the pros and cons, and then take a final decision that should be in line with German interests. China-Pakistan Economic Corridor (CPEC) is a “flagship project” of China’s entire Belt and Road Initiative (BRI) (Mardell and Eder, 2018). Up to $55 billion will be invested in the CPEC, which was launched in 2014 and which China recently described as the “fastest and most effective” of all its BRI projects. CPEC involves expanding Gwadar port, and constructing energy pipelines, power plants (which alone cost $35 billion), hundreds of miles of highways and high-speed railways, fiber-optic cables and special economic zones (Chandran, 2018). Therefore, in terms of creating local jobs, there is a public perception that there will be no obvious benefits when cooperating with China to construct infrastructure projects. However, according to estimation from China’s Ministry of Commerce, as of May 2017, China has invested more than $50 billion in BRI countries since 2013 and Chinese businesses have built fifty-six economic and trade cooperation zones, generating nearly $1.1 billion in tax revenue and creating 180,000 local jobs (Liu, 2018). On December 27, 2018, China’s State-owned Assets Supervision and Administration Commission of State Council (SASAC) and Chinese Academy of Social Sciences co-released an industry report named Research Report on Overseas Social Responsibility of Central Enterprises. According to this report, China’s central state-owned enterprises (SOEs) are stimulating job markets of economies involved in BRI, as a growing number of them are enhancing their employment mechanisms aside from increasing job opportunities. Until end of 2018, these central SOEs have hired more than 360 thousand local employees in all BRI host countries (People.cn, 2019). Therefore, what are the facts in the host countries of BRI? Is China hijacking jobs or creating jobs? This essay tries to answer this question by studying the employment of CPEC energy projects. Pakistan is the fifth most populous country in the world with a population of 207 millions, it is also one of the world’s largest youth bulge country with 48 percent population aged 15-49. In terms of the size of the labor forces, Pakistan is the 10th largest country in the world. In 2012/2013, the number of unemployed people was 3.73 million out of the total labor forces of 59.74 million (MoF Pakistan, 2015). Given the very large scale of Chinese investments on CPEC, both the government and the people of Pakistan have very high expectations that CPEC will boost Pakistani economic development and create tremendous job opportunities. According to estimation from “the News International” of Pakistan, CPEC will create around two million direct and indirect new jobs (The News International, 2016). Gwadar Port Authority (GPA) Chairman Dostain Khan Jamaldini said that the port city alone would be able to create over 40,000 jobs having more capacity of job opportunities in future (Business plus, 2016). According to The CPEC Portal, until June 2017, CPEC has created over 38,000 jobs, of which 30,000 have been secured by locals. The 17 early harvest projects of CPEC, of which 11 are in implementation already, have become a source of direct and indirect employment, and more than 75% jobs are available for locals (The CPEC Portal, 2017). Sahiwal Coal Power Plant is regarded as one of the early harvest projects under CPEC. The project was launched by two Chinese state-owned enterprises, Huaneng Shandong and Shandong Ruyi Technology Group Co., Ltd., with the share of 50% each. However, Shandong Huaneng Company is responsible for the operation of the Power Plant. It is a 2x660 MW power plant with the utilization of the most advanced technologies, and has the capacity to generate over nine billion KHW of electricity annually, which is enough to meet demand of over 10 million households. The founding ceremony of this project took place on July 31st, 2015 and was completed in a period of 22 months and 6 days, ahead of the deadline of the contract (Zia and Waqar, 2018a). According to Zia and Waqar (2018a), the main reason for this composition is the unavailability of required skills of Pakistani domestic labor forces. Hence, the management of the Chinese enterprises was forced to hire labors from China which certainly cost them more in terms of wage, security, insurance and other travelling costs. For unskilled jobs there were actually more Pakistani workers than Chinese workers. 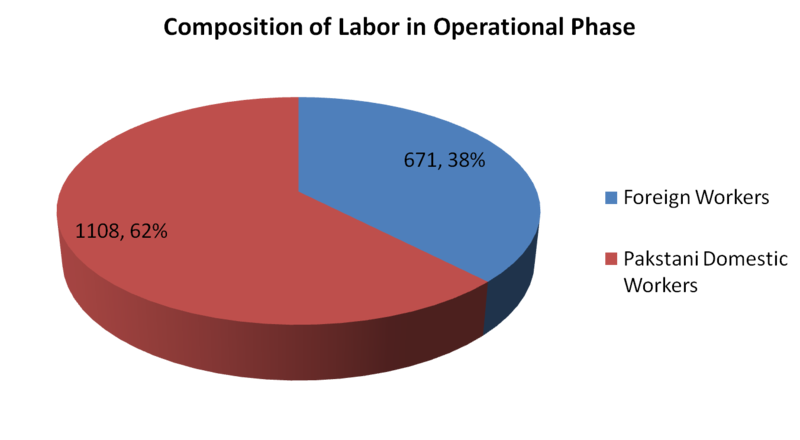 The total direct jobs created during the operational phase are 1,779, from which 1,108 (62.3%) are the Pakistani domestic labors while 671 (37.7%) were from China. As the plant is super-critical and utilizes various advanced technologies, the skills of Pakistani labor forces are insufficient to meet the requirements of operating this modern power plant. Therefore the Chinese preferred to employ and train fresh qualified engineers from numerous engineering universities in Pakistan to address this problem. The first batch was fully hired from University of Engineering and Technology Lahore (UET) and National University of Sciences and Technology Islamabad (NUST). The graduates hired from UET were 80 to 90 out of 124 engineers, while the rest were the graduates of NUST. However, the next recruitment in 2016 was selected from almost all the major universities of Pakistan. Soon after the recruitment, the employees were sent to China for six months of technical training. After returning to Pakistan, they were sent to UET to complete a specially designed 12-module program. All of these candidates have returned back until August 2017 to operate the plant. Currently, the most Chinese workers are working in the maintenance department; all of them shall leave Pakistan within three years. Therefore, around 100 Pakistani domestic workers have been hired in 2017 in order to take over the work of the Chinese in the maintenance department. The plant planned to hire 100 additional Pakistani domestic workers in 2018 for the same purpose. Meanwhile, Zia and Waqar (2018a) have also observed that national and international training as well as workshop seminars had been organized, job promotion was fairly awarded without nationality based bias or discrimination. Overall, the leaders are developed from within the plant. The above analysis focuses on the direct jobs created under this project. However, the plant has further sub-contractors which are required to accomplish other tasks including security and coal intake from the railways to the coal mill etc. These requirements also create many indirect jobs for Pakistani people. There are totally 16 energy projects under CPEC. According to Rashid et al. (2018), if taking Sahiwal power plant as a benchmark for the upcoming projects, the number of jobs to be created during the constructional phase is estimated to be 50,828, while 22,900 jobs have been created under 5 energy projects which include coal power plant as well as hydro projects. Thus, totally 73,728 jobs will be created under these energy projects. Among them around 30,966 (42%) would be Pakistani workers while around 42,762 (58%) would be Chinese workers who are more than local labors. However, given that many Pakistani graduates have already gained the required skills during the construction of Sahiwal Coal Power Plant and other projects, and the Chinese investors are planning to decrease the number of Chinese employees by further providing training to Pakistani labors, therefore it is expected that the number of Pakistani workers during operational phase would be much higher than that of Chinese workers, and the percentage of Pakistani workers of all the energy projects during operational phase could be also higher than that of the Sahiwal Coal Power Plant which is a early harvest project. Zia and Waqar (2018b) have also studied six CPEC and related road infrastructure projects. The results show that approximately 52,000 direct jobs have been created under these projects. Among them only 7% are Chinese workers. Hence, the outcome of their study negates the impression that only the Chinese are getting the employment in CPEC projects. 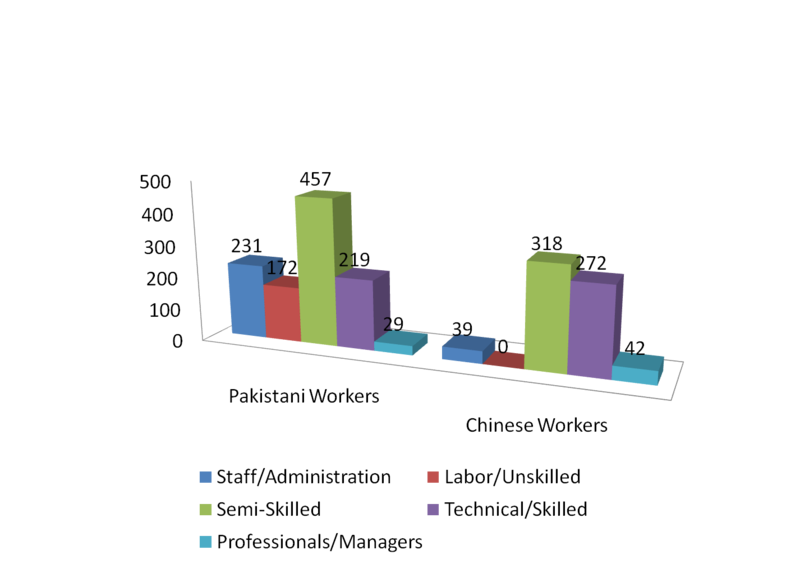 According to this result, Zia and Waqar (2018b) made a conclusion that the criticisms of hijacking job market by Chinese nationals are usually based on perception and political statements, which should be overlooked and changed to focus towards the long-term and sustainable development, growth and prosperity of Pakistan. Compared to these road projects, obviously the percentage of Chinese workers in the energy projects are much higher. The reason could be that energy projects are more technology-intensive than road projects, and there is still big gap between the skills of Pakistani labor forces and the technical and managerial demands of these energy projects, therefore the investors had to bring qualified labor forces from China to Pakistan. China’s approaches of implementing its ambitious BRI strategy have caused deep concern that it is not interested in creating jobs for host countries, instead, China prefers to bring large-scale Chinese labor forces to these countries to carry out BRI projects. However, the results of studying CPEC energy projects show that this perception does not entirely fit the facts. Although there are more Chinese workers than Pakistani labor forces during constructional phases of these energy projects, but this could be due to the skill deficits of Pakistani labor forces. During operational phase of these power plants, much more Pakistani workers are hired than Chinese workers. The Chinese investors are also training and empowering Pakistani locals so that Chinese workers could return to their home when Pakistani workers are able to take over the entire operation. Compared to more technology-intensive energy projects, the percentage of Pakistan domestic workers in the CPEC road infrastructure projects is much higher; this fact also negates the perception that China is not willing to create jobs for host countries of the BRI projects. On the other hand, there is still room for the Chinese enterprises of carrying out BRI projects to improve the fulfillment of their social responsibilities; knowledge transfer and empowerment of the local workforces should be continued and enhanced. Business plus (2016) 300 factories to generate 40,000 jobs at Gwadar Port. Available at: https://www.businessplustv.pk/2016/06/30...at-gwadar-port/ (accessed January 14, 2019). Chandran, N (2018) China can make its Belt and Road project more successful if it taps locals, experts say. CNBC. Available at: https://www.cnbc.com/2018/09/14/china-mu...tive-panel.html (accessed January 14, 2019). https://www.csis.org/analysis/defining-o...e-rex-tillerson (accessed January 14, 2019). Ibrahim, Z and Jaipragas, B (2018) NOTHING TO FEAR FROM CHINA, SAYS MALAYSIA’S MAHATHIR MOHAMAD, BUT LOPSIDED DEALS MUST END. South China Morning Post. Available at: https://www.scmp.com/week-asia/geopoliti...ohamad-lopsided (accessed January 14, 2019). Liu, W (2018) China’s Role in Global Governance. Carnegie-Tsinghua Center for Global Policy. Available at: https://carnegietsinghua.org/2018/09/10/...nance-pub-77204 (accessed January 14, 2019). Malik, A (2016) What CPEC means for South Asia: It fundamentally alters Pakistan’s alignment, sundering its link to the subcontinent. THE TIMES OF INDIA. Available at: https://timesofindia.indiatimes.com/blog...e-subcontinent/ (accessed January 14, 2019). Mardell, J and Eder T (2018) The BRI in Pakistan: Too big to fail. Mercator Institute for China Studies. Available at: https://www.merics.org/en/blog/bri-pakistan-too-big-fail (accessed January 14, 2019). http://www.finance.gov.pk/survey/chapter..._Population.pdf (accessed January 14, 2019). http://ccnews.people.com.cn/n1/2019/0102...7-30498461.html (accessed January 14, 2019). Rashid, S, Zia, M and Waqar, S (2018) Employment Outlook of China Pakistan Economic Corridor: A Meta-Analysis, Centre of Excellence-CPEC. Available at: https://cpec-centre.pk/wp-content/uploads/2018/10/021.pdf (accessed January 14, 2019). Smith, J (2018) China’s Belt and Road Initiative: Strategic Implications and International Opposition. The Heritage Foundation. Available at: https://www.heritage.org/asia/report/chi...onal-opposition (accessed January 14, 2019). The CPEC Portal (2017) CPEC early harvest projects create over 30,000 jobs for locals. Available at: http://www.cpecinfo.com/cpec-news-detail?id=MzE3Nw== (accessed January 14, 2019). https://www.thenews.com.pk/latest/133092...erate-2mln-jobs (accessed January 14, 2019). Zia, M and Waqar, S (2018a) Insights of Employment of CPEC Energy Projects, CPEC Quarterly Spring Issue-2018. Available at: http://www.cpec.gov.pk/brain/public/uplo...Magazine2-2.pdf (accessed January 14, 2019). 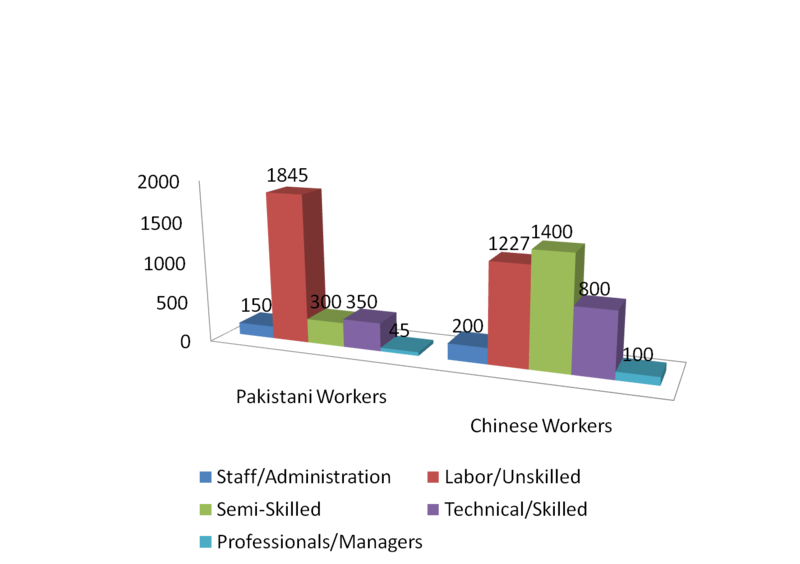 Zia, M and Waqar, S (2018b) Employment Generation and Labour Composition in CPEC and Related Road Infrastructure Projects, Centre of Excellence-CPEC. Available at: https://cpec-centre.pk/wp-content/upload...re-Projects.pdf (accessed January 14, 2019). I have just watched Donald Trump's first national address on border wall and government shutdown, and the immediate response from Nancy Pelosi and Chuck Schumer. What a poor President of the United States! This is my perception. Trump is demanding $5 billion in border wall funding. Come on! Only 5 billion USD, it is just a small money, but as the President of the richest and strongest country of the entire world, Trump has to actually use all his means to convince or "force" the congress to approve his plan, even at the price of government shutdown. As the head of state and chief of government, the power of American President seems very limited. Is that the so-called “check and balance”? With such limited power, how can he "Make America Great Again"? Compared to poor Trump, obviously our President Xi is far more powerful. Look at China’s unprecedentedly ambitious “Belt and Road Initiative”! This grand strategy spans over 60 countries and will cost over a trillion dollars. Early in 2013, our powerful President declared his decision, but he did not need an approval from the National People’s Congress at all. Who is more powerful? President Xi is probably better equipped to achieve "the great renaissance of the Chinese nation". If Trump were smart enough, he should turn to China! 5 billion dollars are nothing for rich China. Trump should make a deal with China to end the trade war which he started. If so, he would need neither Mexico nor Congress to pay for his wall, China will pay everything. Moreover, China is very good at infrastructure building, in this respect China could also offer its help. Who has built the Great Wall? Everyone knows, the workload at Huawei is extremely heavy. I cannot deny this judgment because I really worked overtime very often at Huawei, especially when I was working in the R&D! At that time I used to arrive in office at 9am and leave office at 11pm. NO weekend at all! And I was not the most hardworking one. The life was then really tough, but Huawei also offered what a young and ambitious man aspired to, namely good pay, opportunities for career promotion, exciting projects, travelling worldwide and working with outstanding people, and so on. I must emphasize, I have no intention to argue in favor of overtime work. For personal life and health, too much overtime work and too heavy workload are really bad and even could be dangerous. However, for China and Chinese young people, do we really have a better choice other than hard work? Why has China achieved an unprecedented economic miracle in the past 40 years? Its large, disciplined and skilled labor forces are exactly one of the reasons. The American President Trump claimed, "We have rebuilt China". Did he mean the American people were also one part of the hardworking Chinese labor forces? I belonged to the labor forces previously, but please, I was not the cheap and unskilled labor force, but very good educated one. In 1978 China was still a poor agricultural country, unlike Western Europe, the USA and Japan, China was a latecomer in modernization and without any colony. Therefore, I can hardly imagine China had any other means other than the ruthless and thorough exploitation of its huge demographic dividend to finalize its industrialization and the subsequent industrial upgrade. In 2010, I became the managing director of Huawei Software Business Unit in Western Europe. At that time the business development of our department was still in early stage, and the operational management was also at a low level. But I was very ambitious and launched a quite radical reform in order to make great achievements in a short time. Of course my motivation was to secure the chance of my own promotion. When I took over this Business Unit, all of its country managers and heads of business divisions were Chinese, there was no any European employee occupying a leadership position. Therefore I promoted many European employees to take over leading positions. Meanwhile, I tried to institutionalize the operation of our department by establishing a mechanism of bi-weekly voice conference across all the countries in Western Europe region. In the past, the official language of our department meetings was Chinese, thus, our European colleagues had no chance to participate the departmental management and decision-making at all. I realized this would restrict the potential of our European colleagues, therefore I changed the meeting language to English. Many Chinese managers were reluctant to speak English because they thought the efficiency of communication would be greatly reduced, but I was unmoved by such arguments and forced them speak English during the bi-weekly meetings. After carrying out these reform measures, the European colleagues were more heavily involved in the departmental management and business development. The effects were obvious, our revenue increased 100% after only one year! I paid very much attention to the formal institutionalization of departmental management and was heavily involved in business development, but unfortunately I have ignored the importance of establishing and maintaining informal network of relations. The result proved to be fatal. Many Chinese managers were against me, and I also failed to win the recognition from my boss. Although I have made an unprecedented business achievement in Western Europe, I was not promoted, but replaced by another Chinese manager. After he took over my position, he immediately cancelled the bi-weekly voice conference call and changed the meeting language back to Chinese. He did not care about the formal institutionalization and localization, but I have to admit, he was very good at building informal network of relations which really plays a decisive role in an Chinese organization. Many Chinese managers praised him, and his boss also recognized him, finally, he was promoted to a higher position. Several years later, I left Huawei, now I heard that the business performance of my previous department was getting worse and worse, so that it was no longer an independent Business Unit. Today, when I look back the reform I pushed for, it can be regarded as an attempt of institutionalization. I don’t think my efforts were wrong, institutionalization is absolutely important for any large organization, however, you can’t ignore the importance of informal network of relations, especially in an Chinese organization! After reading this paper I realized the relations between Germany and China are not so fragile and unstable as I thought before. Actually we should not overestimate the importance of the ideological differences between the two countries. Instead, the both share quite a lot of common interests: economical, political and even strategic. In my opinion, today’s foreign policies of the both countries follow to a greater extend the institutionalism of the international relation theories, which is quite different from the realistic, nationalistic and unilateral approach of the USA under the leadership of President Trump. I used to believe Germany was just the political colony of the USA without basic political independence. This impression could be wrong! At least for some important issues, Germany has bravely taken different positions against the USA. Professor Staack mentioned in his paper an very important political and strategic event. In 2004/2005 the George W. Bush administration of the US had the plan to accept east Asian countries, especially Japan, to join NATO. Given that Japan and China are actually strategic rivals, China must strongly oppose this action. But eventually this plan has not been implemented, one of the most important reasons is that, Germany opposed this idea! The motives for Germany’s attitude are obvious. First, Germany has no interest in taking sides in unresolved territorial conflicts in east Asian region. Secondly, it has very close ties with all the states of the region and therefore has no interest in supporting one regional power against another. And thirdly, from the German point of view, it is highly questionable whether NATO should play any active role in the Asia-Pacific region and whether it is in Germany's foreign and security interest. Therefore, Germany actually has its own positions in terms of foreign policies and strategies. Recently, Germany is not willing to follow the USA and Australia to forbid Huawei’s 5G products and solutions into German market, this is another evidence of Germany’s political independence from the US. I need to write a seminar paper on China's foreign policy, now I am struggling to find a concrete thesis. I don't want to only focus on China because I am not only a Chinese but also a world citizen, since I have worked in China, India, Africa and Europe for a long time. I really can be regarded as a person with world perspective instead of a narrow nationalist. Therefore, I prefer to write something on Sino-German relations. Professor Lian Yuru from Peking University has argued for a long time, that Germany and China are natural partner, because the two countries actually have no fundamental conflicts, instead, they share many common interests. Professor Lian's argument seems reasonable and meaningful, especially under the condition that the US is probably recalibrating its world strategy. The Trump administration treats China increasingly as its prime competitor, and Germany is no longer the loyal little younger brother of the US as it was during the cold war. The German foreign minister Heiko Mass has openly talked about the necessity of reconsidering Germany's dependence on the US. In this sense, it could be very interesting to study the Sino-German relations under the new conditions. What do you think about this topic? Any suggestions or comments are welcome and appreciated. The Trump administration has decided to withdraw its more than 2000 soldiers from Syria, the reason is that "the mission of defeating IS is delivered". I really doubt if the Americans have read my article written on Dec. 1st, 2015 (德军能给叙利亚带去民主吗？). It seems they agree with the approach I have argued. The key issue in Syria is to restore the law and order instead of pushing "regime change" to carry out the so called "experiment of democracy". Democracy is indeed a luxury which must be based on the principle of the separation of the religion from the state. Meanwhile, a prosperous, stable and solid middle class is also indispensable. In order to meet these requirements, Syria still has a long way to go. Among all the political forces in Syria, only Assad regime is able to restore the order. If the foreign powers destroyed this regime, the perspective of ending the long lasting civil war would be very gloomy. What happened in Libya? Trump's decision shows us that the Americans have accepted the ruthless fact that Russia and Iran had won this geopolitical competition at this moment. However, it could be also possible that Trump administration is trying to withdraw from the troublesome middle east and mobilize more resources to the so called "indo-pacific" region, in order to contain its prime competitor: CHINA. Das chinesische Sozialkreditsystem (engl. : Social Credit System, im Folgenden SCS genannt) umfasst derzeit über 40 verschiedene Pilotprojekte. In diesen Projekten wird im Einklang mit der chinesischen Strategie von „Tests im Kleinen – Implementierung im Großen“ auf kommunaler und regionaler Ebene getestet, wie ein zukünftiges SCS für die gesamte Volksrepublik China aussehen könnte. Dabei werden in den verschiedenen Pilotprojekten unterschiedliche Zielgruppen in die Versuchsreihen miteinbezogen und es werden unterschiedliche Anreize und Strafen für die Teilnehmer ausprobiert. Die höchste Planungsstufe des gesamten Projektes ist die im Juni 2014 vom Staatsrat veröffentlichte „Gliederung des Bauplans für ein SCS (2014-2020)“ (社会信用体系建设规划纲要). Im Jahr 2015 ging dann auch die Website „Credit China“ online, die Informationen zum gesamtchinesischen SCS-Projekt bietet. Chengdu ist nun seit 2015 offiziell eine der ersten Demonstrationsstädte für den Aufbau des von der Zentralregierung genehmigten SCS-Pilotprojektes. Als Motivationen der Stadt werden nicht nur die dringende Notwendigkeit, das rasche Voranschreiten der Entwicklung eines Sozialkreditsystems auf nationaler Ebene zu gewährleisten, sondern auch eine gesündere und beschleunigte Entwicklung der Wirtschaft von Chengdu und die Veränderung des wirtschaftlichen Entwicklungsmodus genannt. Die konkreten Grundlagen der Entwicklung eines SCS sind in Chengdu wesentlich älter als 2015. Bereits 2002 wurden in der Entwicklungsstrategie „Ehrliches Chengdu“ (诚信成都) folgende Ziele festgelegt, die im Weitesten mit den Zielen eines nationalen SCS übereinstimmen: Erstens sollten Ehrlichkeit und Vertrauen in der Gesellschaft gefördert werden. Zweitens sollten Unternehmen dazu gebracht werden, sich an geltendes Recht sowie ihre eigenen Versprechen zu halten. Drittens sollte die Regierung Vorreiter und Entscheider im Kreditsystem sein. Viertens wird die Oberaufsicht über das Kreditsystem festgelegt. Dabei wurde betont, dass zuerst die rechtlichen Grundlagen geschaffen werden müssen, gefolgt von der Errichtung von Plattformen. Nach Abschluss dieser beiden Arbeitsschritte könne mit der schrittweisen Implementierung und Verbesserung begonnen werden. Der erste Schritt hin zu einem wirklichen SCS wurde 2014 von der Provinzregierung von Sichuan durch die Veröffentlichung des „Bauplans für das Sozialkreditsystem der Provinz Sichuan 2014 - 2020“ (四川省社会信用体系建设规划（2014—2020年）) getan. Ein Jahr später folgte auf Bezirksebene der „Bauplan für das Sozialkreditsystem in Chengdu 2015 - 2020“ (成都市社会信用体系建设规划（2015—2020年）), der ausführlich alle Details zum SCS in Chengdu regelt. Nachdem die Richtlinien von der Zentralregierung zunächst auf Provinz- und dann auf Bezirksebene kamen, wurde dort in Chengdu mit der Umsetzung begonnen. Dem Plan entsprechend war der erste Schritt die Schaffung rechtlicher Grundlagen und Regularien. So wurden beispielsweise „Maßnahmen zur Verwaltung von Unternehmensinformationen in Chengdu“ (成都市企业信用信息管理办法), „Verwaltungsvorschriften für Daten von Kreditvermittlern“ (成都市中介机构信用信息管理规定) und „Standards für Daten in der SCS Plattform“ (信用信息资源平台数据规范) als zentrale Elemente beschlossen. Nachdem diese Grundlagen gelegt wurden, fuhr die Stadtregierung fort, unterstützende Regularien einzuführen. Dazu gehören zum Beispiel die folgenden: „Aufteilung von öffentlichen Kreditinformationen über Unternehmen“ (企业公共信用等级划分), „Datenelemente der Plattform für Kreditinformationen“ (信用信息资源平台数据元), „Maßnahmen für das Kredit-Informationsmanagement der Stadt Chengdu“ (成都市房地产行业信用信息管理办法), „Kreditstandards für die Immobilienbranche in Chengdu“ (成都市房地产行业信用记分标准) und die „Übergangsmaßnahmen für die Verwaltung der Kreditratings von kleinen und mittelständischen Unternehmen“ (中小企业信用评级管理暂行办法). Die Evaluierung fand unter anderem durch „Umsetzungsgutachten zur Einrichtung einer Demonstrationsstadt für den Bau eines Sozialkreditsystems in Chengdu (2015 - 2016)“ (成都市创建社会信用体系建设示范城市实施意见（2015-2016年）) statt. Durch diese Maßnahmen wurde ein umfassender Referenzstandard für die Erhebung, Nutzung und Überwachung von Kreditinformationen in der Stadt geschaffen, der die Unparteilichkeit und Gleichheit der unterschiedlichen Teilnehmer am SCS garantieren soll. Der Stand 2016 bezüglich der Reichweite des SCS in Chengdu lässt sich wie folgt darstellen: Rund 900.000 Marktteilnehmer aus ‚normalen‘ Haushalten und 36.000 Schlüsselpersonen (z.B. mit besonderer Ausbildung oder großem Einfluss) wurden erfasst. Eine konkrete Zahl für Unternehmen, NGOs und Regierungsbehörden liegt mir bisher nicht vor. Per 2016 wurden zudem insgesamt rund 30 Millionen Kreditdatensätze im SCS erfasst. Zum Vergleich: Die Einwohnerzahl Chengdus beträgt mindestens 15 Millionen. Die zum Pilotprojekt gehörende Website wurde im täglichen Durchschnitt rund 12.000 Mal aufgerufen. Die oben erwähnte Website ist quasi das Herzstück des SCS-Projektes in Chengdu. Hier kann jeder Nutzer, ob Privatperson oder Unternehmen, eine Vielzahl an Informationen über das SCS erhalten. Dabei ist es unerheblich, ob man über eine in- oder ausländische Verbindung auf die Website zugreift. Die Hauptseite bietet ein Suchfeld, in dem man anhand verschiedener Merkmale (z.B. Name, Kreditnummer oder sonstige Schlüsselbegriffe) nach Unternehmen, juristischen Personen, Organisationen oder Institutionen suchen kann. Über dem Menüpunkt „Kredittrends“ (信用动态) bekommt man Zugriff auf verschiedene Nachrichten bezüglich des SCS. Die Nachrichten kann man sich entsprechend der Verwaltungsebene für Chengdu, Sichuan und die VR China anzeigen lassen. Der Punkt „Policy Regulierungen“ (政策法规) führt zu einer Reihe von Bekanntmachungen; hier können aber nur Informationen aus Chengdu selbst angezeigt werden. Der Bereich „Kreditservice“ (信用服务) bietet allerhand weitere Möglichkeiten, um nach Personen zu suchen, die sich verschiedene Vergehen zuschulden kommen lassen haben – von Wortbruch im geschäftlichen Bereich bis zu groben Rechtsverletzung oder Steuervergehen. Insgesamt betrachtet wirkt die Website sehr benutzerfreundlich und intuitiv bedienbar. Interessiert man sich zum Beispiel nur für die Ereignisse in der eigenen Nachbarschaft, so kann man sich alle Bekanntmachungen sowie rote und schwarze Listen auch nach Stadtteilen gegliedert ansehen. Dafür muss man lediglich einmal auf die Karte von Chengdu klicken. Zudem lässt sich feststellen, dass der Austausch zwischen verschiedenen Pilotprojekten auf der Website bereits teilweise funktioniert. Einerseits sind die Websites anderer Pilotprojekte verlinkt, andererseits kann man sich unter dem Menüpunkt „Regionale Verkettung“ (区域联动) direkt Informationen über Personen oder Firmen aus einige anderen Pilotprojekten ansehen. Auswählbare Städte sind zum Beispiel Hangzhou, Deyang oder Luzhou. Besonders ist auch die Integration der Website beziehungsweise der Daten in andere Systeme. Neben der Hauptwebsite gibt es eine mobile und etwas eingeschränkte Version derselben sowie vier mobile Applikationen zum Download. Zwei davon sind direkt als IOS- und Android-Apps für das Handy zu benutzen, zwei sind als Integration in andere Portale (WeChat und Weimenhu (微门户)) nutzbar. Zum Stand der beiden Apps und der Weimenhu-Integration kann ich keine Angaben machen, aber die WeChat-Integration bietet praktischen Zugriff auf Bekanntmachungen, Nachrichten, sowie rote und schwarze Listen. Vorteilhaft ist dabei, dass man nicht erst eine App herunterladen muss und genau wie für die Website keine Anmeldung oder ein Zugriff aus China beziehungsweise via VPN erforderlich sind. Das Pilotprojekt Chengdu arbeitet explizit mit der Veröffentlichung von roten und schwarzen Listen. Diese sind von verschiedenen Menüpunkten der Website aufrufbar und werden dadurch im Webauftritt gut fokussiert. Die roten Listen, die besonders kreditwürdiges und gesetzeskonformes Verhalten loben, sind sehr vielfältig: Es gibt rote Listen für verschiedene Geschäftsbereiche, Listen die nur für einen Stadtteil von Chengdu, und Listen in denen öffentliche Institutionen ausgezeichnet werden. Ähnlich divers sind auch die schwarzen Listen. Die folgende Liste entstand durch die Entscheidung des Gerichtes in Xinjin, (新津) Unternehmen, die gegen eine Vorschrift verstoßen und die daraufhin angeordneten Bußgelder nicht gezahlt haben, in dieser schwarzen Liste aufzuführen. www.creditchina.gov.cn/ ; Die Website ist momentan nicht zu erreichen, wenn man ein herkömmliches Antivirenprogramm nutzt, da eine Warnung vor Trojanern erscheint.